In case you missed it among all of the election chaos last week, infamous hate preacher Louis Farrakhan traveled to Iran and led a "death to America" chant while he was there. 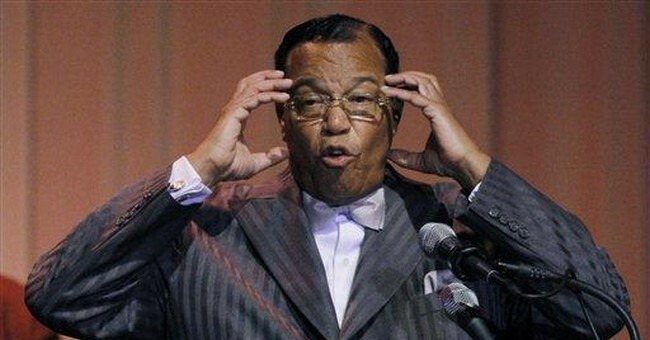 Iran state TV news presenter: Listen to leader of Nation of Islam chanting "Death to America"
Farrakhan [in Farsi]: "Death to..."
Farrakahn denies leading the chant, despite being caught on video doing so. Meanwhile, he's back in America and scheduled for a talk in Washington D.C. this weekend. The Women's March, which has been endorsed by Democrats across the country, has close ties to Farrakahn. Its leaders have referred to him as a mentor and essential leader in today's politics. In recent days they've attempted to distance themselves from his hateful positions, which includes calling Jews "parasites."